The base of this ecosystem is the Hadoop Distributed File system derived from the Google's whitepaper for Google File System(GFS). Lets take a simple example to understand HDFS. Lets say we have a record containing the phone numbers of all the people in a city. You use say a 5 machines Hadoop Cluster to keep this data. Lets say we want to have a replication factor of 3 which means every chunk of data you have will have 2 extra backup copies stored on different machines. Further lets assume that you divide the hard disks on your 5 machines into 78 pieces. Lets say you store phone numbers of all the people whose names start with 'A' on one piece of a disk and keep its back up on the other two machines. Similary do that to all people's names starting with alphabets 'B'-'Z' In this way you organize your data on the 3 machines. MapReduce: To generate a report from all the data, you would now need MapReduce codes. The MapReduce API is available opensource for use. But you will have to write some good Java codes to run the map jobes parallely on all those machines and get the results back (Reduce) to generate the final report. Hive & Pig Frameworks: Writing MapReduce jobs isnt a piece of cake. So, Facebook made the Hive framework allow an easy way to do the same. Hive uses SQL-ish syntax to do things on the data lying on the Hadoop layer below. Pig is a similar framework built by Yahoo but it is more of a data flow language. In Hive a user can specify that data from two tables must be joined with an easy syntax like SQL, but not what join implementation to use. Pig is procedural and though you will have a little more to write there it does allows you the flexibility to specify an implementation of how you would like to join different chunks of data. HBase is a NoSQL database that allows you to work the enormous amount of data stored on the Hadoop system. It is a column-oriented database management system. It is well suited for sparse data sets, which are common in many big data use cases. HBase does not support a structured query language like SQL. They are written in Java much like a typical MapReduce application. ZooKeeper is a centralized infrastructure that helps synchronize across clusters. It maintains common objects needed in large cluster environments. Examples of these objects include configuration information hierarchical naming space, and so on. Applications can leverage these services to coordinate distributed processing across large clusters. Sqoop can be used to import data from a RDBMS system (say MySQL/Oracle/MsSQL server) into HDFS or vice-versa. 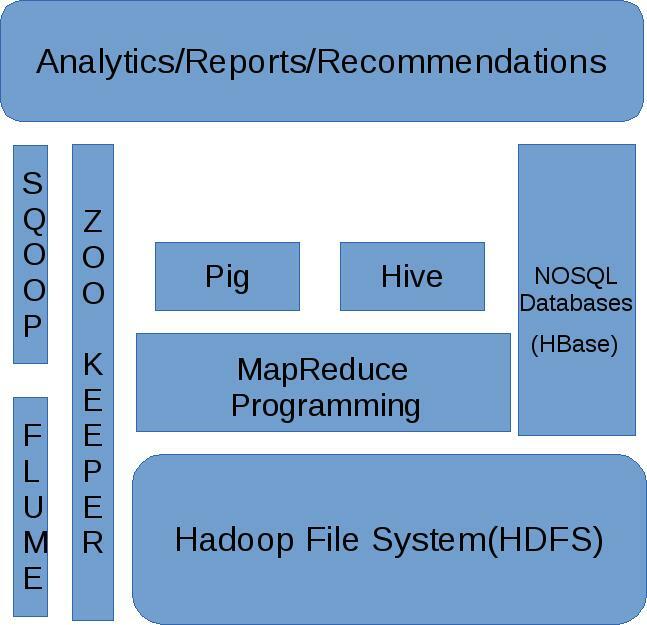 Flume is the tool to gather data from various sources into your Hadoop system. Its mostly used for log data. Currently we do some analytics and recommendations minus these fancy tools as we do not have 'BIG' DATA yet :P Some custom code, DB, ML libraries, Redis and third party services are sufficient if you are talking in GB's.